Welcome to the official devotional page. Are not five sparrows sold for two pennies? Yet not one of them is forgotten by God. Birds have been a source of inspiration throughout history. They have had a powerful place in our cultures as symbols of freedom and wisdom as well as spirituality. Birds can inspire and amaze us with their beauty, songs and ability to fly, and are present in the culture of virtually every human society, especially in the arts, religions and mythologies. In our contemporary cultures they are always present in our lives in art works, brand logos and even postage stamps. Every bird has an allure of its own. For some their beauty is their plumage, for others it is their flight, their song, their courtship displays, or a combination of each. Birds also speak to us in many ways and with many voices: in myths, songs, folklore and poetry. They are also a source of profound spiritual inspiration. Their songs can seem as sublime as the most accomplished musician, and together their chorus becomes an impromptu symphony. In 2004, my life-changing event took place in a residential resort down south while I was out entertaining a group of Korean teen-agers. I secretly excused myself and wandered off on the other side of the lake while they went fishing and boating. Carrying a telescope on one shoulder, I was excited to explore the surrounding vegetation. A few minutes later, my world literally changed when a “blue bird” suddenly flew by to catch some fingerlings swimming in the lake. I literally froze for a few seconds gathering my composure trying to figure out what I just saw. “There’s a blue bird in the Philippines? !” I quietly thought. Almost immediately, I felt disappointed realizing the depth of my ignorance about birds found in my beloved country. The following weeks and months leading up to nine years made my quest to see and understand more bird species insatiable. Multiple doors have opened leading to the founding of the Philippine Bird Festivals, international birding events, bird-guiding, lectures, and even photography. That “blue bird” I saw nine years ago was the spark that brought about all these. The Collared Kingfisher is my spark bird! What I saw through the telescope’s eyepiece that day nine years ago simply took my breath away. I was drawn and in awe while observing the color and intricate details of the bird’s feathers and markings. “Oh, so beautiful”, I thought to myself! And, I wanted to know more about these magnificent winged creatures. I had a profound realization of how these birds are well taken care of; neither struggling nor toiling, being fed by our Heavenly Father each day and night. They “know” where food is abundant. They have shelter when the storms come. I was humbled by this seeing an aspect of faith in play. Truly, God’s creation points us to Him, teaching us about faith’s simplicity. The next time you spot a bird, think about how our Heavenly Father unfailingly cares for it. 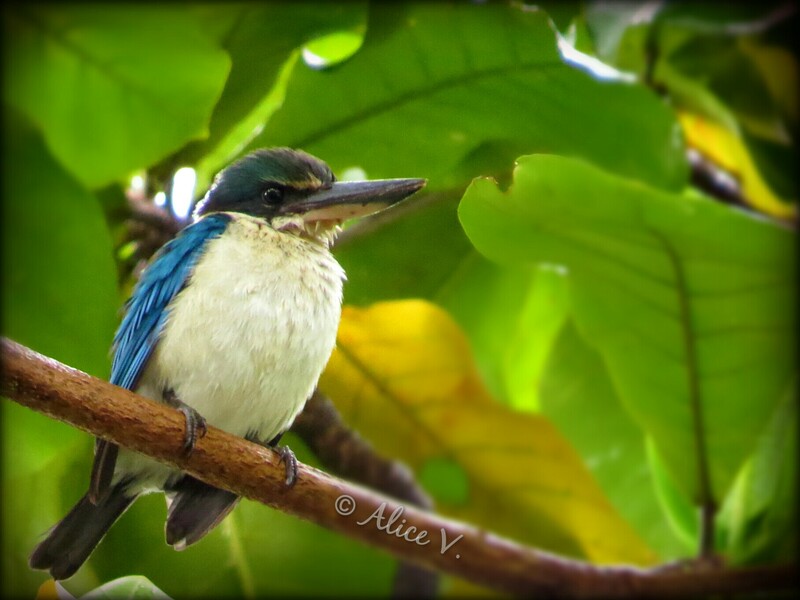 My spark bird, the Collared Kingfisher visited our garden last September 5. I was once again in awe and wonder as I observed it foraging on earthworms wiggling in water puddles after a downpour. I am again reminded of our Heavenly Father’s faithfulness. Here is a photo I took of that bird perched in our Talisay tree.